Last August (2015) I purchased two online encaustic painting classes from Carla Sonheim. Wasn't sure how these would work, but in a word ....fantastic! I hadn't heard of Stephanie Hargrave before, but I just love her work. Beautiful organic shapes, expressive line work and rich, rich colour. 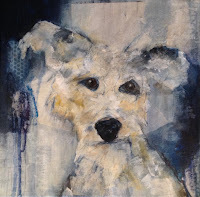 I recommend both classes - Intro to Encaustic Painting and Creating a Modular Encaustic Painting. I am watching them both for the second time, taking lots of notes. The wax is out and heating and I am looking forward to more experimentation. These 4 pieces are meant to be hung together in a vertical format. They make a nice grouping when displayed this way. They are on Ampersand Claybord (4"X4"). 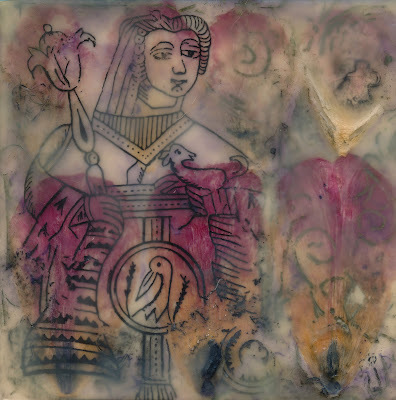 Multiple layers of wax medium with image transfers, pigment rubbed into incised lines and chiri tissue.